Oats is gaining popularity mainly because of its health benefits and also they are convenient and easy to cook. It is said that fiber and other nutrients found in oats may help lower cholesterol, reduce high blood pressure and also reduces the risk of certain type of cancers. It contains a good source of protein, vitamins, minerals,iron, complex carbohydrates and antioxidants. I have posted different ways to use oats to make easy and delicious breakfasts. 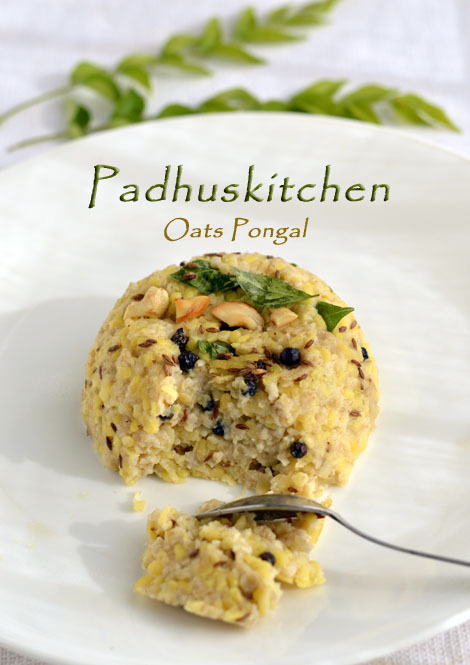 Today we will see how to make Oats Pongal following our easy recipe. Soak moong dal (split green gram dal) in hot water for 10 minutes and cook until soft. Fry cashew nuts in 1/2 tsp of ghee until golden brown. Fry oats in 1/2 tsp of ghee for 2 minutes in low flame. Cook oats in half a cup of water adding salt. Then add cooked moong dal to oats and cook for some more time until well blended. Check for salt. Heat 2 tsp of ghee, add pepper and jeera seeds, when jeera sizzles, add ginger, curry leaves, saute for a second and pour it over the cooked oats + dal mix. Mix well. Garnish with cashew nuts and serve hot with coconut chutney or pongal sambar. Note - This pongal should be taken hot. If you found this post useful, kindly consider linking to it or sharing it with others or like us on Facebook or follow me on Twitter or join me on GooglePlus to keep up to date with Padhuskitchen. photos are good ! i loved it ! i do it other way this one looks easy ! healthy pongal recipe.. looks great !! It looks good!nice picture too! Woww looks yummilicious...Wish I could grab that platter... :) Yum!!! We made oats ven pongal and chakra pongal for Pongal this year without using Rice! healthy dish nice way to start the day! Thanks a lot for your recepie. An easy yummy healthy breakfast..